Democrat Maxine Waters currently represents Congressional District 43. Waters is expected to easily win re-election in 2016. Elected in November 2012 to her twelfth term in the House of Representatives with more than 70 percent of the vote in the 43rd Congressional District of California, Congresswoman Waters represents a large part of South Central Los Angeles including the communities of Westchester, Playa Del Rey, and Watts and the unincorporated areas of Los Angeles County comprised of Lennox, West Athens, West Carson, Harbor Gateway and El Camino Village. 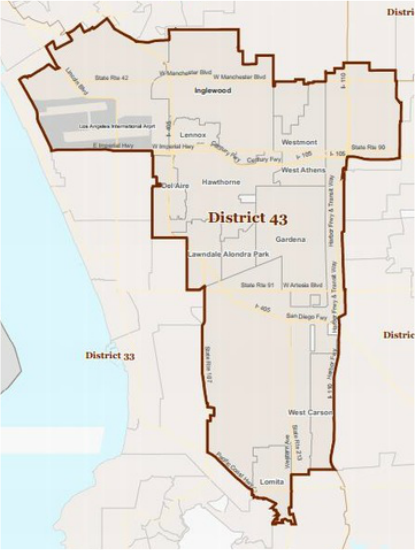 The 43rd District also includes the diverse cities of Gardena, Hawthorne, Inglewood, Lawndale, Lomita and Torrance. Throughout her 37 years of public service, Maxine Waters has been on the cutting edge, tackling difficult and often controversial issues. She has combined her strong legislative and public policy acumen and high visibility in Democratic Party activities with an unusual ability to do grassroots organizing. Prior to her election to the House of Representatives in 1990, Congresswoman Waters had already attracted national attention for her no-nonsense, no-holds-barred style of politics. During 14 years in the California State Assembly, she rose to the powerful position of Democratic Caucus Chair. She was responsible for some of the boldest legislation California has ever seen: the largest divestment of state pension funds from South Africa; landmark affirmative action legislation; the nation’s first statewide Child Abuse Prevention Training Program; the prohibition of police strip searches for nonviolent misdemeanors; and the introduction of the nation’s first plant closure law. As a national Democratic Party leader, Congresswoman Waters has long been highly visible in Democratic Party politics and has served on the Democratic National Committee (DNC) since 1980. She was a key leader in five presidential campaigns: Sen. Edward Kennedy (1980), Rev. Jesse Jackson (1984 & 1988), and President Bill Clinton (1992 & 1996). In 2001, she was instrumental in the DNC’s creation of the National Development and Voting Rights Institute and the appointment of Mayor Maynard Jackson as its chair. Following the Los Angeles civil unrest in 1992, Congresswoman Waters faced the nation’s media and public to interpret the hopelessness and despair in cities across America. Over the years, she has brought many government officials and policy makers to her South Central L.A. district to appeal for more resources. They included President Clinton, Vice President Al Gore, Secretaries of Housing & Urban Development Henry Cisneros and Andrew Cuomo, and Alan Greenspan, chairman of the Federal Reserve System. Following the unrest, she founded Community Build, the city’s grassroots rebuilding project. She has used her skill to shape public policy and deliver the goods: $10 billion in Section 108 loan guarantees to cities for economic and infrastructure development, housing and small business expansion; $50 million appropriation for “Youth Fair Chance” program which established an intensive job and life skills training program for unskilled, unemployed youth; expanded U.S. debt relief for Africa and other developing nations; creating a “Center for Women Veterans,” among others. Rep. Waters continues to be an active leader in a broad coalition of residential communities, environmental activists and elected officials that aggressively advocate for the mitigation of harmful impacts of the expansion plan for Los Angeles International Airport (LAX). Furthermore, she continues initiatives to preserve the unique environmental qualities of the Ballona wetlands and bluffs, treasures of her district. She is a co-founder of Black Women’s Forum, a nonprofit organization of over 1,200 African American women in the Los Angeles area. In the mid-80s, she also founded Project Build, working with young people in Los Angeles housing developments on job training and placement. As she confronts the issues such as poverty, economic development, equal justice under the law and other issues of concern to people of color, women, children, and poor people, Rep. Waters enjoys a broad cross section of support from diverse communities across the nation. Throughout her career, Congresswoman Waters has been an advocate for international peace, justice, and human rights. Before her election to Congress, she was a leader in the movement to end Apartheid and establish democracy in South Africa. She opposed the 2004 Haitian coup d’etat, which overthrew the democratically-elected government of Jean-Bertrand Aristide in Haiti, and defends the rights of political prisoners in Haiti’s prisons. She leads congressional efforts to cancel the debts that poor countries in Africa and Latin America owe to wealthy institutions like the World Bank and free poor countries from the burden of international debts. Congresswoman Waters is the founding member and former Chair of the ‘Out of Iraq’ Congressional Caucus. Formed in June 2005, the ‘Out of Iraq’ Congressional Caucus was established to bring to the Congress an on-going debate about the war in Iraq and the Administration’s justifications for the decision to go to war, to urge the return of US service members to their families as soon as possible. Expanding access to health care services is another of Congresswoman Waters’ priorities. She spearheaded the development of the Minority AIDS Initiative in 1998 to address the alarming spread of HIV/AIDS among African Americans, Hispanics and other minorities. Under her continuing leadership, funding for the Minority AIDS Initiative has increased from the initial appropriation of $156 million in fiscal year 1999 to approximately $400 million per year today. She is also the author of legislation to expand health services for patients with diabetes, cancer and Alzheimer’s disease. Congresswoman Waters has led congressional efforts to mitigate foreclosures and keep American families in their homes during the housing and economic crises, notably through her role as Chairwoman of the Subcommittee on Housing and Community Opportunity in the previous two Congresses. She authored the Neighborhood Stabilization Program, which provides grants to states, local governments and nonprofits to fight foreclosures, home abandonment and blight and to restore neighborhoods. Through two infusions of funds, the Congresswoman was able to secure $6 billion for the program. She is lauded by African American entrepreneurs for her work to expand contracting and procurement opportunities and to strengthen businesses. Long active in the women’s movement, Rep. Waters has given encouragement and financial support to women seeking public office. Many young people, including those in the hip-hop music community, praise her for her support and understanding of young people and their efforts at self-expression. One testament to her work is the Maxine Waters Employment Preparation Center, a multimillion dollar campus providing education and employment opportunities to residents of the Watts area. Maxine Waters was born in St. Louis, Missouri, the fifth of 13 children reared by a single mother. She began working at age 13 in factories and segregated restaurants. After moving to Los Angeles, she worked in garment factories and at the telephone company. She attended California State University at Los Angeles, where she earned a Bachelor of Arts degree. She began her career in public service as a teacher and a volunteer coordinator in the Head Start program. She is married to Sidney Williams, the former U.S. Ambassador to the Commonwealth of the Bahamas. She is the mother of two adult children, Edward and Karen, and has two grandchildren.